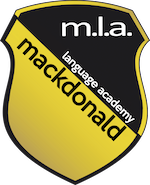 This mackdonald language academy Ltd. privacy statement explains the kinds of information we may obtain from or about you as a visitor to our website or as a user of our educational services; how we may use that information (together with information provided offline or via other means); and who we may share that information with. 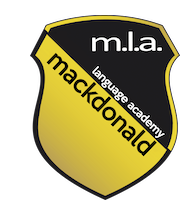 mackdonald language academy Ltd. respects your right to privacy and we are committed to complying with applicable data protection and privacy law. Your personal information may also be processed by other organisations on our behalf for the purposes outlined above. We may disclose your information to partners, associates, agents or subcontractors and to possible successors to our business. Some of these parties may reside outside the European Economic Area (which currently comprises the Member states of the European Union plus Norway, Iceland and Liechtenstein). If we do this, your information will be treated to the same standards adopted in Ireland. We may also disclose your information for the prevention and detection of crime and to protect the interests of mackdonald language academy Ltd. or others, or if required to do so by law or other binding request. Under Data Protection Law you have the right to access, erase or correct information held about you in certain circumstances, and to have some of that data (if held by mackdonald language academy Ltd.) provided to you in a portable form. You have the right to request a copy of any personal information we hold about you. For further information in relation to this please contact our Data Protection Leader (at) mackdonald (dot) com. Cookies are used to assist in making a website work more efficiently. They are used to remember your preferences, for example; your IP address and the time you first visited the website. When you leave the site and come back to it, this information can be reloaded from your computer thereby generally improving your user experience. By default, this only user for one hour. We may also use Google Analytics which is a tool that records data about all the users who arrive to the website. The cookies that are used by Google Analytics are detailed on this page. What types of Cookies are used on www.mackdonald.com? These Cookies are essential to enable you to move around www.mackdonald.com and use its features, such as accessing secure areas of the website. These Cookies collect information about how visitors use www.mackdonald.com, for instance which pages visitors go to most often, and if they get error messages from web pages. These Cookies don't collect information that identifies a visitor. All information these Cookies collect is aggregated and therefore anonymous. It is only used to improve how www.mackdonald.com works. www.mackdonald.com does not use these cookies in any part of our website. This session cookie has a timeout that expires if there has been no activity between your computer and the website in excess of one hour. This cookie is reset each time you return to www.mackdonald.com Do data is saved from this cookie. We and/or our contracted web analytics provider(s) keep track of the domains from which you access our site and services on the World Wide Web, and may log IP addresses or other identifiers for statistical purposes. We do this to gather broad demographic information for aggregate use to identify and analyze trends and the results of our marketing efforts, to help diagnose problems with our servers and to administer the site and services, and analyze users' movements. IP addresses and other identifiers are not linked to personally identifiable information. We will endeavor to take all reasonable steps to keep secure any information which we hold about you, and to keep this information accurate and up to date. In addition, our employees and data processors are obliged to respect the confidentiality of any personal information held by us. However, we will not be held responsible for events arising from unauthorized access to your personal information. Your trust in us is very important to us. Your information will never be used without your explicit consent. It will never be given to a third party.